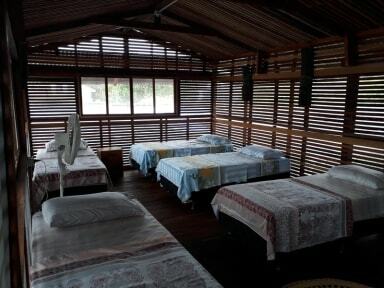 Anaira Hostwel is a new hostel with great location, a pool, hammock area, open green spaces, free drinking water and a nice staff ready to share the Amazon knowledge with you. We offer free airport pick up. We can help you to organize the best journey in the Amazon through our travel desk, we provide you free city maps if you need it! We are in downtown Leticia in a quiet street, close to some restaurants, bars, banks, shops, and everything you could need. We are located just four blocks from the 'Malecon' port of Leticia, and 20 minutes walking from Leticia's airport or 5 minutes by Taxi. 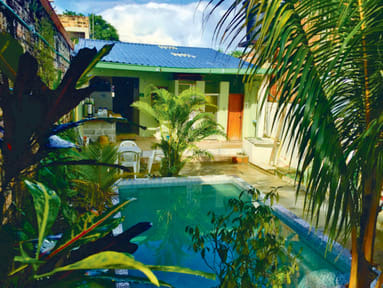 Tabatinga (Brazil) is around eight blocks from the Hostel. We have five rooms in total: four private rooms and one dorm for 8 people. Two privates bathrooms and the others are shared. The dorm includes two showers and two toilets. Check in from 11:30 AM to 23:00 PM. This is a very cheap hostel so you can’t expect much. Reception service is not 24 hours so I was warned that I was lucky to still have been able to check in at 7 pm coming back from a jungle trek. The water tank was empty so had to wait until the next morning to shower. Ants in the room (on the floor and bed). Great, non-included breakfast.